ntry meeting at windy Westward Ho! The course is flat, but has a number of deep boggy ditches which athletes have to negotiate. It was juniors Iona Farquharson and James Alcock who produced the performances of the day finishing 2nd in their races. These results mean Torbay A.C. are in contention for silverware with the U13 Girls 2nd in the league with Iona Farquharson topping the individual table, Lily Bates is 3rd place in the U17 girls, Hayley Ratcliff is 2nd and Sara Crozier 3rd in the FV50 categories and Denis Doy lies 3rd in MV65 category. 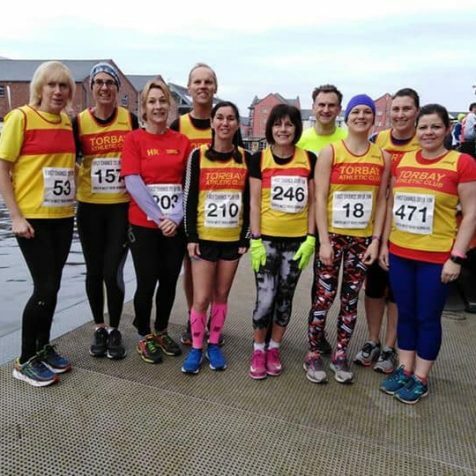 Torbay AAC were well represented with 18 members on a bright and calm Sunday morning at the First Chance 10k, a sell out event hosted by South West Road Runners. It was a delight to catch up with friends not only from our club but also those sporting vests of other colours. The setting for this popular run is on the paths around Exeter Riverside Valley Park. The cool, tranquil morning didn’t disappoint and despite some tweaks to the course due to the engineering works 575 runners set off to tackle what for many would be their first official race of the year. The course is described as “fast and flat” today it was also gravelly with big puddles in some sections (even a bit of mud!). We ran alongside the early morning rowers and all were overjoyed to receive a lovely boot bag as a memento at the end of the slightly long course. Many thanks to the organisers for a great event and to all the marshals and support crew that make it all possible. 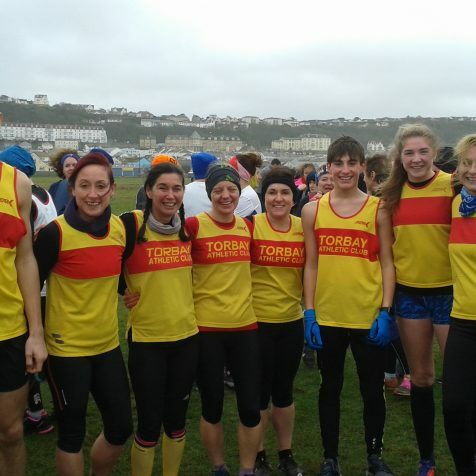 Torbay AC’s chip time results were, in position 10 and 1st mv/50 Peter Monaghan (35:37), 40 Kevin Fine (38:38), 55 Steve Weeks (39:39), 100 Amelia Hall 3rd fv50 (44:37), 127 Ian Hayward (45:56), 128 Karen Baddeley 2nd fv55 (45:57), 146 Nick Robinson (46:50), 177 Debbie Drake (48:02), 201 Hayley Ratliff (49:18), 213 Jonathan Cowling (49:41), 218 Sara Crozier (50:04), 223 Fleur Ricklin (50:22), 224 Steven Lofthouse (50:05), 226 Ray Brown 3rd mv70 (50:34), 262 Irene Hewings 3rd fv60 (52:39), 353 Tessa Hearfield (57:02), 477 Gemma Radcliffe (1:04:27), 529 Kirsten Mundy (1:10:27).